Do you need the help of our Competent Fire Safety Practitioners (CFPS) with an urgent Annual Fire Safety Statement (AFSS)? Are you are the owner of a building who needs to have an Annual Fire Safety Statement (AFSS) or Fire Safety Certificate (FSC) prepared for issue to the council? Or perhaps you are a tenant who has been asked by the landlord or owner to issue a statement of service compliance. Survival Solutions are competent fire safety practitioners (CFSP) and can help you with the inspection, assessment, preparation and certification of your fire safety system in both of the above cases. 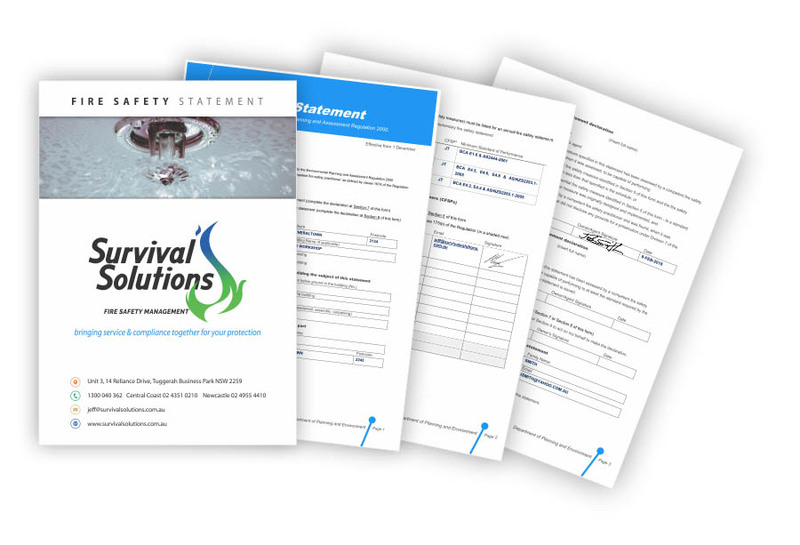 Servicing Sydney North, Central Coast, Newcastle and the Hunter, Survival Solutions can maintain your fire safety system and annual fire safety statement (AFSS) on a needs basis, or establish you as regular service client as required and manage your council obligation before they fall due. If you are like us, you will be seeking a prompt, reliable and cost effective service. Please phone 1300040362 or submit a request for assistance below to book a site inspection or get a service quote. Need help with your fire safety maintenance and certification? We can help you determine if you are compliant. Contact us today to book a complete site assessment.